When we lived in the communal house for eleven months, we did a lot of quick and "as healthy as possible" meals. We were limited to one bin in the fridge and one bin in the freezer for our cold items, as well as a small pantry (18" x 12"). So....imagine keeping all of your cold grocery items in one crisper drawer of your fridge, because that's exactly the size we were stuck with for eleven months! It's tough, but we made work and had some pretty tasty meals in the process. I bought the Weight Watchers New Complete Cookbook years ago and have a couple of entree's I make including shrimp scampi & beef and broccoli stir fry! 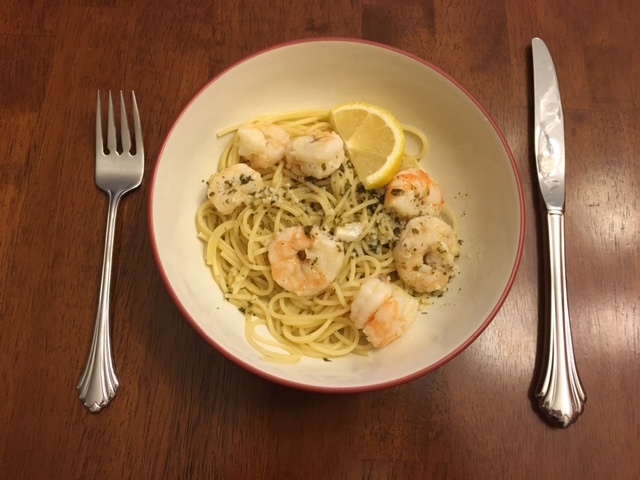 To make the shrimp scampi, I tend to keep frozen wild caught shrimp in our freezer (~$14/pound) and always have thin spaghetti on hand. Two fresh items are: lemons & parsley (I just used dried parsley). You can choose to use fresh lemons or the prepackaged lemon juice at the grocer (I've done both variations, but prefer to use fresh organic lemons if possible). 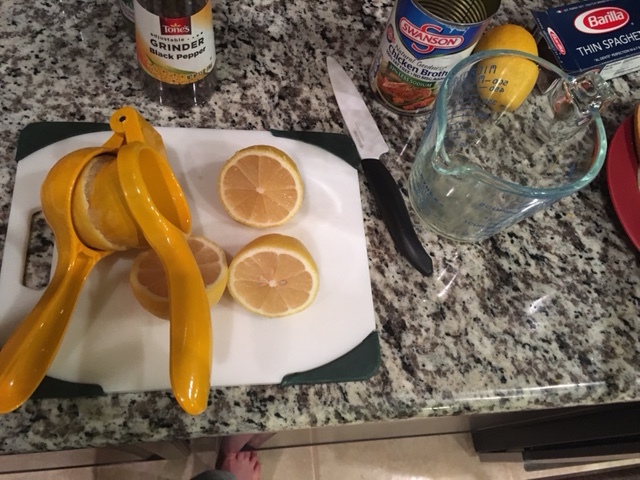 Whatever lemons I don't use and they start to turn bad, I cut them up and toss them down the sink drain and turn on the garbage disposal to freshen up our sink drain. Works like a charm and if you ask me, it works better than baking soda and vinegar! 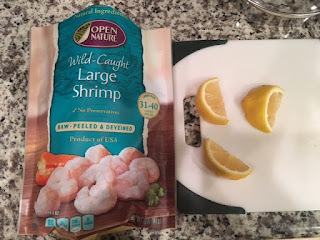 1 pound frozen wild caught large shrimp (peeled & deveined) -- wild caught is so much tastier (& healthier) -- we've tried farm raised and wild -- wild is soo much better! 3) Boil water for spaghetti noodles and cook noodles according to directions. *My sister is gluten free, so when we made it for her, we substituted the spaghetti noodles for cooked spaghetti squash. 4) Then, add the EVOO to the frying pan (I use a deeper frying pan) and let it warm up on medium heat. 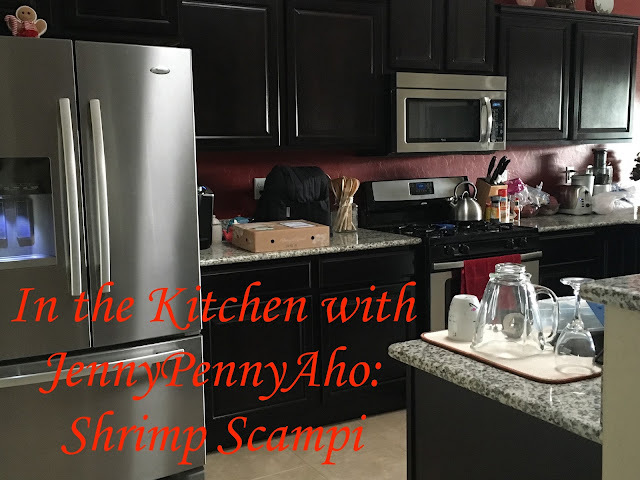 6) Once pink, use a slotted spoon to remove the shrimp to plate (keep them hot because you will add them on top of the noodles shortly). 6) In the frying pan, combine the lemon juice, chicken broth, parsley, salt, pepper and bring to a boil and continue to boil uncovered until the sauce is reduced by half. 8) If I have an extra lemon, I garnish the dish with a slice of lemon, but it's completely up to you! I hope you enjoy this quick and easy meal as much as my husband and I do!